Have you noticed that after a day at the office, or after a long Netflix binge session, your body is full of aches and pains? And just when you thought that you could easily fight through the pain, you are clueless on what to do. Wrists hurt from typing. Necks and shoulders ache after being bent over a computer all day. Hips and legs and feet… everything hurts. When these aches and pains hit, most people reach for pills or salves to try to deal with the achiness in their muscles and joints. This only masks the problem, though, and it never lasts for long. A few hours later, and the pain has come roaring back. Don’t you wish there was a way to really get rid of those aches for good? The best way of keeping from having this pain is by staying mobile, which prevents it from starting in the first place. In fact, one of the best things you can do to cope with this problem is simple, easy to do, and absolutely free. A basic stretching routine can be the difference between feeling good and mobile and feeling stiff and sore. Stretching can get the blood flowing, energize the body, and help ease movement by keeping the ligaments loose and the muscles warm. Regular stretching to keep muscles and ligaments limber can help fight through the pain and cut down on the sort of injuries that can happen when you try to exercise “cold” – strains, pulls and sprains. When you’re stretching, there are a few simple rules that you should follow so you can get the most of the experience. DO – stretch before a workout. It wakes up your muscles and gets your body ready to work. DO – stretch after a workout, too. This encourages new muscle cells and fibers to grow. DO – stretch chronically tense places more often. If you have a lot of built-up tightness, enough to make a known trouble spot, then it’s going to take a little more work to get that tightness worked out. DO – use extra support if you need it. Stretch bands can help you get deeper into a stretch, and if you need to hold on to something to maintain your balance, then do. There’s no need to be proud. It’s more important to avoid falling and hurting yourself! DON’T – stretch fast. It’s important to move slowly and deliberately. Otherwise, you run the risk of tearing the tissues you’re trying to loosen up. DON’T – bounce when you stretch. This is called ballistic stretching, and it can pull your muscles by pulling them too far. DON’T – stretch injured muscles. You have to let injuries heal before you work them, and stretching strained muscles just pulls the torn fibers farther apart. Now that you know what to do and what not to do, here are the twelve best, simple stretches to include in your routine to fight through the pain. These stretches are easy to do, and for the best outcome, you should try to do them every day. As always, like with any exercise program, check with your doctor before you begin, especially if you’re getting over an injury. Stop immediately if there’s any pain with any of these movements. Remember to move slowly and always make sure you stretch both sides of your body evenly. Neck Rotation – Start by sitting in a chair with your chin tucked down and back, keeping your neck aligned with the rest of your spine. Turn your head to the right and hold it here for twenty to sixty seconds. Face forward, then turn your head to the left and hold. Neck Tilt – Tilt your head toward the right, then extend your right arm over your head until your hand is on your head by your left ear. Don’t pull your head over; let the weight of your arm stretch our neck muscles by tilting your head farther to the side. Hold the position for twenty to sixty second, then straighten. Switch sides and repeat. Trunk Rotation – Still sitting, cross your arms in front of your chest. Turn to look over your right shoulder, rotating your trunk at the waist. Hold the position for twenty to sixty seconds. Turn back to face the front, then stretch the other side. Backward Back Bends – Sit up straight and reach up over your head with both hands. Either interlace your hands or put your palms together. Bend your back slightly toward the back of the chair, hyperextending your spine as you do. Hold. Don’t force the stretch, and if you have any pain, stop. Be careful not to bend too far, this might jeopardize your effort to fight through the pain. Straighten back to neutral and return your arms to your sides. 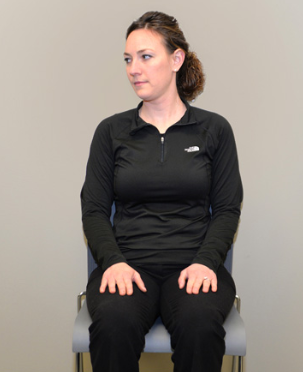 Trunk Side Bends – While sitting, put your left arm across your torso with your hand on the right side of your waist. Moving at the waist, bend to the left and extend your right hand over your head toward the left. Your right inner elbow should be at the top of your head. Hold. Straighten to neutral, then stretch the other side. Fold Over – Cross your legs so that your right foot is on your left thigh. Bend over at the waist, keeping your back and neck in alignment. Make sure you stop if there’s any discomfort. Straighten up, switch feet, and bend again. If you can’t get your feet into position on your opposite thigh, it’s okay to leave both feet flat on the floor. The point is to stretch your back, and if you have to open your knees to do this, that’s okay, too. Back Scratch – Sit up straight. Hold your right arm so that the elbow is pointed at the ceiling and your hand, palm facing in, is between your shoulder blades. Take your other arm and bend it so the elbow is pointing down, and bring your hand, palm out, up as close to the other hand as you can. Hold. If you can touch your hands together, great, but don’t push it if you can’t. Switch arms and repeat. Quad Stretch – Another stretch to fight through the pain is done standing up, and it requires good balance, so don’t be shy about hanging on to a wall or the desk. Grab the top of your foot and bend your knee until it’s pointing at the floor, right hand to right foot. Gently pull your foot toward your buttocks. Hold. Switch sides and repeat. Heel Cord Stretch – Stand facing the wall. Put your palms flat against the wall. Put one foot with the toes against the wall and the other foot about a foot behind the first. Bend the knee that’s closer to the wall and hold your position. The stretch should activate the back of the ankle and heel’s away from the wall. Switch sides and repeat. Hip Flexor – Lie down face up on a mat or other soft surface. Try to keep your spine as neutral as possible. Keep one leg straight. Bring your other knee toward your chest. You can use your hands to bring it in closer if you need to do so. Hold. Switch sides and repeat. Leg Extension – Still lying down with your spine positioned as neutrally as possible, keep one foot planted on the floor while you bring the other foot up and point it at the sky. Ideally, the leg that’s being raised should be at a ninety-degree angle from your hips. You can use a workout band or a towel around the bottom of your raised foot to help deepen the stretch. Hold. Switch sides and repeat. Be gentle – if you can’t quite get to ninety degrees, even with the band or towel, that’s fine. Stop if you feel any pain, especially in your lower back or hamstring. Piriformis – This is the last stretch exercise that you could try to fight through the pain. Still lying down, keeping your neck and back neutrally positioned, plant your left foot on the floor. Bring your right ankle over your left thigh above the knee. Hold. Switch sides and repeat.